Charles K. "Rusty" Epps grew up in Columbus, Georgia and, at age 14, was first licensed as KN4BVD in 1958. He obtained his General Class license the following year and became an Amateur Extra Class in 1967. He moved to California full time in 1968 and became W6OAT in 1974. Rusty has always considered himself to be both a DXer and a contester. He created the Georgia QSO Party and did all the initial log checking while still in high school. After moving to California, he became a founding member of the Northern California Contest Club and has served variously as its President, Secretary and as a Director. NCCC has named him its "Contester of the Year". Rusty was the primary instigator persuading NCCC to assume administration of the very popular California QSO Party and personally performed all the log checking in the early years of CQP. He was a co-creator of the North American Sprint contest and also served as administrator of that contest for fourteen years. Rusty drafted the rules for the first World Radiosport Team Championship (WRTC) held in Seattle in 1990 and was Chief Judge for that competition. He has been involved with every subsequent WRTC and serves on the committee which sanctions future WRTC events. On the DX side, Rusty joined the Northern California DX Club in 1968 and has served as both the President and as a Director of NCDXC. He authored the NCDXC's petition which added North Korea as a new entity to the DXCC list, and has been honored by being named NCDXC's "DXer of the Year". Rusty's first DXpedition was in 1974 when he and three other NCDXC members were selected to operate from Palmyra Island and then proceed to Kingman Reef where he made the first-ever QSO from that new DXCC entity. Additionally, Rusty has helped organize and participated in major DXpeditions to Nepal, Clipperton Island, and Syria. Rusty joined the NCDXF's Board of Directors in 1975 and served his first term as President in the late 1980s. He has been the Section Communications Manager for the ARRL's San Francisco Section, an Assistant Director in the Pacific Division, a Sixth District QSL Bureau card sorter, and an ARRL Volunteer Counsel. Rusty holds DXCC (373 entities confirmed), #1 DXCC Honor Roll, 5B-DXCC, 5B-WAS, 5B-WAZ, and is a member of the CQ DX Field Award Honor Roll. He was one of only two individuals who successfully earned the ARRL's 40 w.p.m. code proficiency certificate the first time that speed ever was transmitted from W1AW. Rusty presently serves on the CQ Contest Committee. 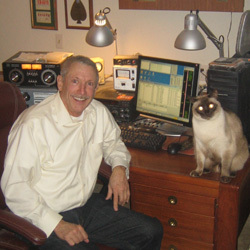 He was inducted into the CQ DX Hall of Fame in May, 1996 and into the CQ Contest Hall of Fame in April, 2005.